Home to impactful history, impressive wildlife and abundant wineries – your visit to Seneca County will leave you with memories to last a lifetime. Located in the heart of the Finger Lakes region, Seneca County is straddled by two finger lakes – Seneca and Cayuga – and connects to the Cayuga-Seneca Canal, a 20-mile portion of the Erie Canal system. One of Seneca County’s most historic communities is Seneca Falls – the scene of the first Women’s Rights Convention, held in 1848. Women’s Rights National Historical Park tells the story of the women’s suffrage movement throughout the Park’s several sites, including the home of Elizabeth Cady Stanton. The National Women’s Hall of Fame highlights the contributions of those who began the fight for women’s rights as well as other distinguished women, showcasing their stories, struggles and accomplishments. Seneca Falls is also believed to be the inspiration for Bedford Falls in the holiday classic, “It’s a Wonderful Life.” The museum dedicated to the film is filled with photographs, memorabilia, and rare artifacts – such as the Academy Awards program from the year the film was nominated. Step into one of mother nature’s special places at the Montezuma National Wildlife Refuge, with trails available for walking, biking, driving, bird-watching, snowshoeing, and cross-country skiing. The varied habitat types of the refuge - such as marsh, forest, and grassland - attract an array of wildlife, with each season welcoming different species. At Seneca White Deer, keep your eyes peeled for the mystical white deer. Once the Seneca Army Depot, built in 1941 by the U.S. Army to store bombs, missiles and ammunition, this park now offers guided tours to see the world’s largest herd of white, white-tailed deer. Surrounded by breathtaking vistas lie the largest concentration of wineries in the region. 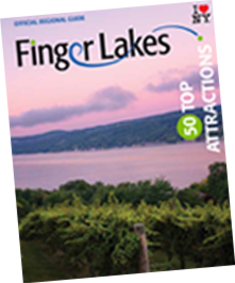 Visitors are able to sip their way through two official wine trails – Seneca Lake Wine Trail and America’s first wine trail, Cayuga Lake Wine Trail – sampling a variety of award-winning wine products. The area also claims micro-breweries, a distillery, meadery, and cidery options sure to please everyone’s preference. From slots to shopping, a stop in Waterloo is a must. After you stock up on your favorite designer and brand names at the Waterloo Premium Outlets, wind down at del Lago Resort & Casino with live entertainment, exciting slots and games, award-winning dining and cool cocktails. Pamper yourself with a treatment at their spa or check-in to one of the hotel’s luxurious rooms. Waterloo is also the origin of Memorial Day, the first of which was held on May 5, 1866. Learn the history of the holiday and the men that proposed the commemoration at the National Memorial Day Museum.